Seriously, how awesome was NZ? Mia: I spent half a year here and it was awesome. It is a very easy-going country, which is very encouraging for young, first-time travelers. I met loads of different people and several that I’d really like to see again someday. 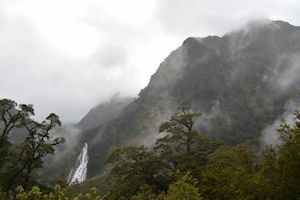 And the sights and nature that New Zealand can offer are just… incredible, and what I will miss the most once I’m home. Can you describe what a Starter Pack Agency does? Mia: They made the transition from life in Denmark to life in New Zealand really easy. At the time, I had very little experience with paperwork such as bank accounts and CV’s, and they helped make it easy. Also, one feels more secure with an emergency contact at hand, and they provided that security. So what do you think about your agency’s services? Mia: It was a friend from day one. I was never completely alone in a new country. I couldn’t get lost. I suppose that helped my parents a bit too, knowing that I had help even though I couldn’t have theirs. Mia: All that setting up with the paperwork, IRD number, bank account, CV was a great help. I had thought of them as slightly daunting tasks but they were just out of the way in no time. They also helped me with organizing a trip for my visiting friends trip, which I really appreciated as an extra service. Can you pick the 3 best moments in your trip? Mia: My 1st week with the hop on hop off bus was definitely the first. I was with an amazing group heading from Auckland to Wellington. I had so many experiences with that bus that I remember those eight days like it was a month. Secondly, when working in a hostel in Punakaiki, I was together with great people who made it a really memorable experience. I was there for only two weeks but that time will stick with me for a long time. The place itself, on the West Coast, was awe-inspiring, but all the more so because of the people I explored it with. Thirdly, welcoming my friend from home to New Zealand and touring the North Island together. 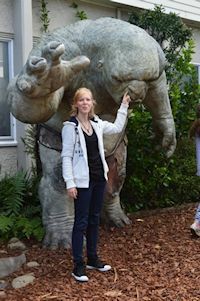 Most memorable of our many experiences are Hobbiton (proud die-hard fans of LOTR) and skydiving; absolutely amazing and surreal experiences in each their own way. 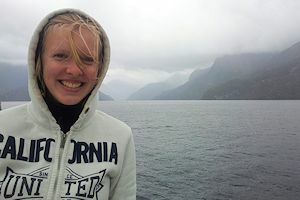 Mia: The most money I spent was on adventure tourism, all of it expensive, all of it amazing! There was white water rafting on the South Island, and a Skydive over Taupo, and a kayaking trip on Lake Taupo. I experienced the latter two with my friend from home, and we both agreed those experiences were amazing, each in their own way. Mia: I worked for accommodation in several places as those jobs were easy to get and not so time-consuming or demanding. 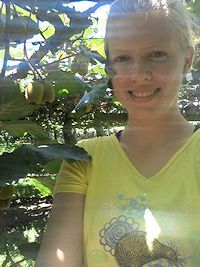 My first hostel job was in Punakaiki, where I got along very well with the team and owner. In Te Anau, I worked for accommodation again. It should have been a real job, but I was there for four weeks and it wasn’t a good fit for me. I was glad to put that hostel behind me! I also worked in a hostel in Rotorua. Since then I have recommended that hostel to everyone I met. I liked the hostel itself, it was like a big cool house, but most importantly I loved the people there too. The only paying job I had was as a kiwi fruit thinner in Te Puke. It only lasted three weeks, but I had some friendly colleagues and our employers were a really nice couple that invited us poor backpackers for dinner several times. Mia: Yes, I did. Some hostels have very nice vibes, and it’s the easiest place to meet other backpackers like yourself. You also took a 12 months bus pass, was it fun? Mia: I definitively liked it! In a normal bus in New Zealand, nobody talks to each other, while in a hop on hop off bus you have many friends straight away. We did activities together and even had group meals, it was really awesome! I recommended the same company to my friend when she came to New Zealand, and though she only had a very short pass compared to my long one, she had a really good time too. You seem like a people person, tell me about one person that you met and was memorable? Mia: I met a girl named Mackenzie during my first hostel job in Punakaiki. From the very first day we just clicked really well and were together every moment from then on for the next two weeks, cleaning, cooking, baking, exploring, talking, or just reading. We had a lot of fun together. Mia: Don’t make too many plans before coming. I’m not a big fan of bucket lists, but have some general ideas of something you absolutely cannot miss, and then hopefully you’ll tick them off along the way and feel like you’ve done what you’ve set out to do! It can be scary not to have a plan. I have never been a spontaneous person so I know that, but planning as little as one-four days ahead worked out very well for me… Mostly. Which leads to my last and most important tip! Make sure to make friends, it got me out of tough situations when Wellington hostels were fully booked… twice! Mia: It taught me that I’m a stronger person than I thought. I went directly from having my parents take care of the housework and cooking to being on my own. There was no time to be scared or shy. Things had to be done, like grocery shopping, cooking, laundry, work, planning trips and booking hostels… and I didn’t think twice. And now here I am, with an adult looking back at me in the mirror! Last question, would you recommend an Arrival Pack to your friends? Mia: Yes, it was a great help and support that I really appreciated. Also, my advisor is a genuinely nice person, and I am really glad that I met him and had his help!